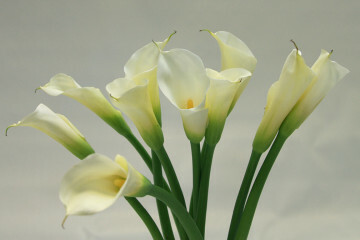 The Calla Lily is a beautiful plant, whether grown outdoors or indoors in a decorative pot by a sunny window. This elegant plant, native to the marshes of South Africa, is not really a lily at all but a member of the Araceae family. The extraordinary funnel or trumpet shaped waxy flowers of a Calla Lily, grow on tall thick stems and have a yellow spadix emerging from their center. The long tapered green leaves of the plant may be streaked with faint white or yellow spots. Today, thanks to the many new hybrids developed by breeders throughout the world, Calla Lilies can be found not only in white, but also pink, orange, fuchsia, red, yellow, and cream. The long lasting flowers are popular in wedding bouquets where they are a symbol of purity and beauty. 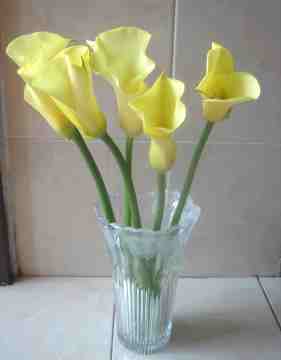 LIGHTING REQUIREMENTS: Calla Lilies require at six hours a day of very bright indirect light. Direct sun during the middle of the day may burn the leaves and flowers. CARE INSTRUCTIONS WATER: These plants like moist soil at all times. 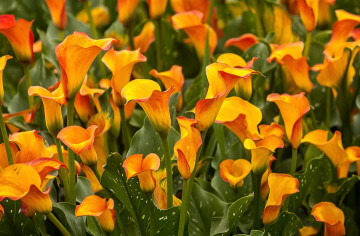 Calla Lilies are not drought resistant and should never be allowed to totally dry out; but will not do well if the soil is too soggy or they are allowed to sit in water. FERTILIZER: Fertilize an indoor Calla Lily every two weeks when the plant is flowering with a liquid plant food low in Nitrogen. When the plant is producing only leaves and no flowers, fertilize monthly. Always dilute the plant food to ½ the recommended strength. If your Calla Lily is planted outside, use a granular plant food instead of a liquid fertilizer. TEMPERATURE: Room temperatures should be between 50-75°F, 10-24°C for optimal growth. Keep Calla Lilies away from heating and air conditioning vents. If planted outdoors, be sure to dig up the Calla Lily bulbs and bring them inside before temperatures dip below freezing. HUMIDITY: Calla Lilies do well in average humidity. FLOWERING: The flowers of a Calla Lily are really spaths similar to those of a Peace Lily but much more impressive. The plant usually blooms for about six weeks during the late spring and early summer. Keeping the plant potbound encourages more blooms. Calla Lilies may be forced into bloom at any time indoors; it all depends on when the bulbs become available and when they are planted. The long lasting cut flowers are perfect in bouquets and flower arrangements. PESTS: Examine a Calla Lily frequently for signs of scale or Aphids. DISEASES: Calla Lilies are susceptible to various viruses and bacterial infections, especially rhizome rot and gray mold. These problems become evident when leaves and stems start to turn yellow before the plant is normally entering its dormant phase. SOIL: Use a good peat moss based potting soil that is well aerated and drains quickly. You can add builder’s sand or perlite if the soil seems too heavy and clay-like.